At the birthplace of the Ganga (Ganges) River. 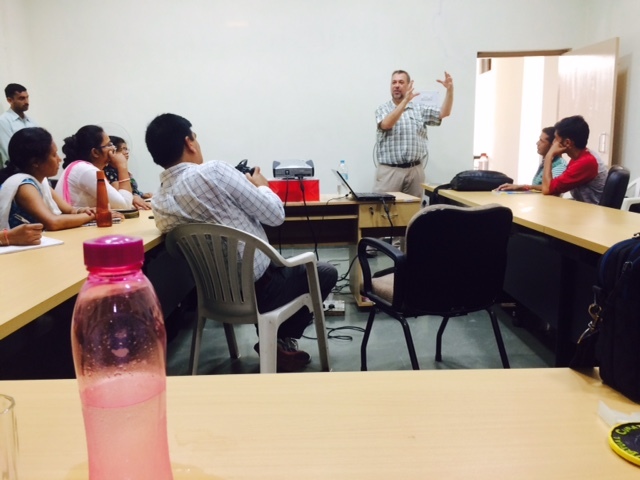 So, why did I just spend almost two weeks in India? Was it to indulge in a bit of world exploration, buy some souvenirs, and eat Indian food? No—although I DO like Indian food. 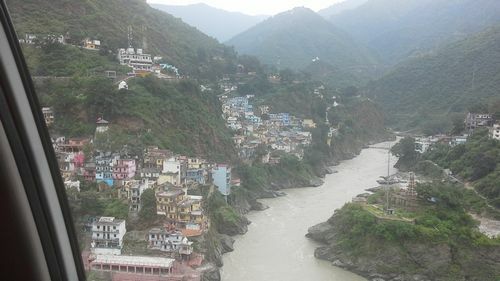 Was I there to be provided a wonderful tour by Rakesh Bhatt of the Siva temple of Rudranath (Gopinath), located in the town of Gopeshwar? Again, no—but that was an unexpected highlight of my recent visit to North India, as I detailed here. Actually, my reason for make the trek to North India was related to the mission of Virginia Commonwealth University’s (VCU) Global Education Office—expanding opportunities for VCU students so they can encounter and experience diverse peoples, places, and heritage beyond the borders of the U.S. As the director of the Virtual Curation Laboratory, I naturally look toward digital means to bring the world to the VCU undergraduates I teach, without their necessarily needing to leave the Richmond campus (although, in the future, I hope to return with VCU students to India). 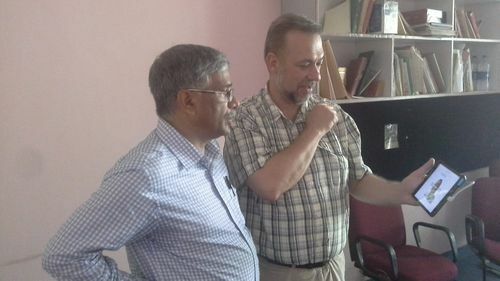 Vinod and I examine a 3D scan in the Archaeological Computing Laboratory at HNB Garhwal University. This story begins with Facebook. Apparently, Facebook is not simply a place to repost videos of cats being cats, pictures of one’s latest meal, or memes with a political bent that will incense your friends who do not share your enlightened political philosophy. Late last year, I received an inquiry through Facebook from Dr. Vinod Nautiyal, who teaches at HNB Garhwal University, located in Srinagar (Garhwal) in the state of Uttarakand, India. Vinod had found me—and the Virtual Curation Laboratory—by searching Facebook for archaeologists with experience using the NextEngine Desktop 3D Scanner. Vinod and I exchanged a few emails and determined that we could build a mutually beneficial collaborative relationship that would aid his graduate students at HNB Garhwal University in using virtual means to preserve India’s heritage, and then share this heritage digitally with my undergraduate students at VCU. 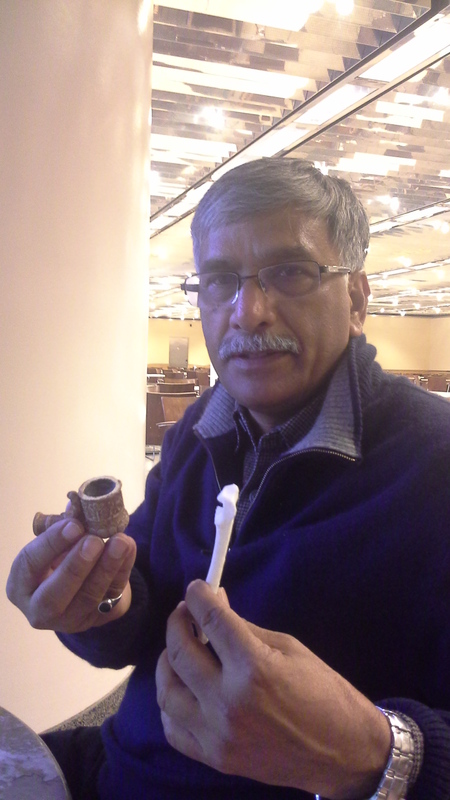 Sitting in the National Gallery of Art, Vinod examines some 3D printed artifact replicas. Because Facebook and email can only do so much, Vinod and I were very fortunate that we could meet at the National Gallery of Art in Washington, D.C. when he came to the area in November 2014 to visit family. We quickly determined that the best way to further develop our collaborative efforts would be for us to exchange visits to our respective archaeological laboratories. Later, we could draw on emails, Instant Messaging, video conferencing, and even Facebook to join together our separate universities, which are located in two different hemispheres and separated by 7517.3 miles (12097.9 kilometers) in a straight line distance. The 9.5 hour time difference is a bit of a challenge to some real-time communication, so some “conversations” will be through recorded video messages. 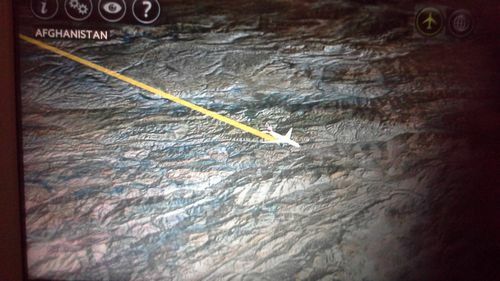 Somewhere over Afghanistan and enroute to India. As I sought support for our project, a call for proposals was released by VCU’s Global Education Office for their Global Classroom Initiative. This initiative is designed to provide educational opportunities that expose VCU students to the world beyond US borders. With Vinod’s assistance, I quickly drafted a proposal and we were successfully funded. Within a few months, I was on my way to India (with a brief layover in London, United Kingdom, so I could visit the British Museum). After a few days in New Delhi, India, to adjust to the local time and the long flight, I arrived at the Jolly Grant Airport in Dehradun on August 3, 2015. This is the nearest—but not exactly close—airport to HNB Garhwal University. 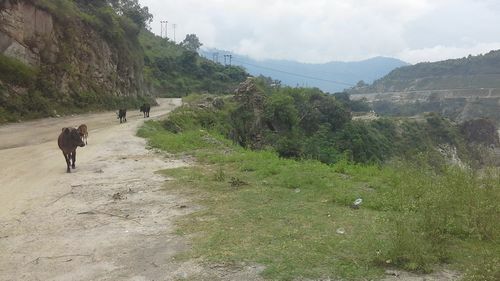 Sudhir Nautiyal, an archaeologist from HNB Garhwal University, and a hired driver met me at the airport for the more than three hour drive over narrow, bumpy, and often congested roads. 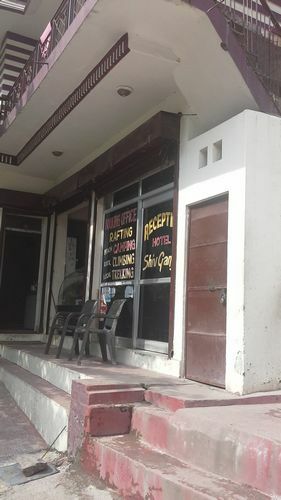 I was eventually dropped off at the Riverside Resorts hotel, which is located along the banks of the Alakanda River, across from Srinagar (Garhwal). Once I was settled, Dr. Vinod Nautiyal and his colleagues met with me to discuss the week’s plans, which included a lecture the next day (Tuesday, August 4) to graduate students from multiple departments at HNB Garhwal University, and would be followed by my examination of their 3D scanning set up. Wednesday, August 5 saw us visit an archaeological site and the Siva temple of Rudranath (Gopinath) in the Garhwal Hills of the Himalayas, as mentioned above. 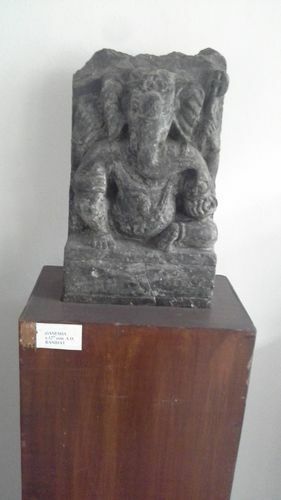 Finally, Thursday and Friday (August 6 and 7) I devoted most of my time to scanning artifacts and sculptures in the Archaeological Computing Laboratory and the Museum of Himalayan Archaeology and Ethnography with archaeologists Sudhir Nautiyal and Mohan Naithani. A second lecture was later added to my schedule for Friday, where I was asked to talk about distance learning, MOOCs (massive open online courses) and how to develop research questions for a graduate thesis. The journey to and from the university each day was….. interesting. On most days, Somya Choudhary, a graduate student at HNB Garhwal University, ferried me back and forth from my hotel to the campus. 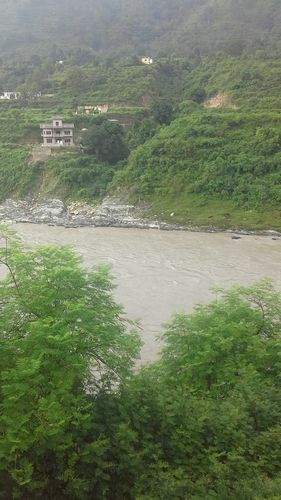 A direct bridge under construction from the hotel side of the river to Srinigar (Garhwal) collapsed back in 2012, so there is no direct way to the university, even though it is only a few kilometers away. Each trip to/from the university took place over roads that were particularly poor, with potholes nearly the size of the car—the trip was literally bone jarring. For most faculty, and people in general that live in the region, the collapsed vehicular bridge is not a significant issue. There are a number of well-constructed narrow bridges that cross the river that are just wide enough to accommodate pedestrian and two-wheeled traffic, particularly via ubiquitous motorcycles. The latter often held at least three passengers, and several times I saw women riding side saddle while men drove these vehicles. Upon my very first arrival at HNB Garhwal University on Tuesday, I was met by Vinod—and no electricity. This was a bit of an issue as I had developed a PowerPoint presentation. The power eventually came on, and I squeezed into a large conference room filled to capacity with students sitting two rows deep behind tables that ringed the room—leaving the middle of the room free. As I set up my lecture on virtual archaeology, we lost power again. The room began to warm rapidly with the robust student presence, only two small windows, and fans that could not work. I at least could use 3D printed models that I had brought with me to talk about the work of the Virtual Curation Laboratory, including the printed models I had taken the previous week to the British Museum. Then, the power was restored, I loaded my PowerPoint presentation, and quickly talked about the various work done in the Virtual Curation Laboratory, highlighted places from where we scanned artifacts, and the key role that undergraduate VCU students play in the operation and research activities of the lab. I also passed models around and just finished the lecture when there was another power loss. Students gamely asked some great questions, but as the room heated up again, we released the students from this enclosed, sweltering space. Vinod, Mohan, and I in the Archaeological Computing Laboratory. 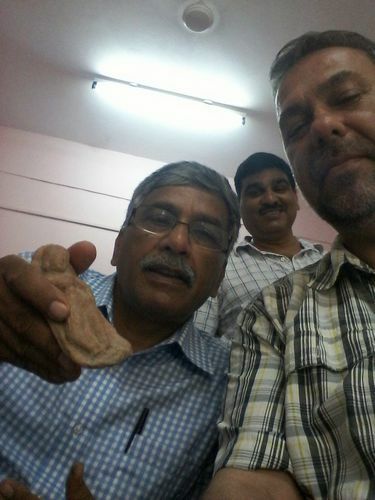 After a tea break (with cookies and samosas), and a tour of the archaeological facilities, I sat down with Sudhir and Mohan. Both are on staff in the university’s archaeology laboratory, with Mohan leading their scanning efforts. I suggested a few changes to their physical layout for the NextEngine 3D scanner, which were quickly implemented. We began scanning—without success. I determined that the computer connected to the NextEngine 3D scanner was running too many programs—especially a memory-hogging antivirus program—and we stared scanning anew. Success, at first, and we obtained a great scan of a terracotta figurine, until the final alignment of the digital artifact model. Computer memory was still an issue, something that Mohan and Sudhir would work on while I was traveling to the town of Gopeshwar the next day. 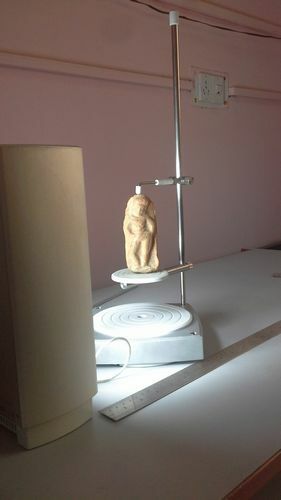 Terracota figurine successfully scanned with the NextEngine Desktop 3D scanner. I returned to the lab Thursday, and great improvements were made to the computer. We successfully scanned a small terracotta figurine of a temple dancer. Editing the file, however, was unsuccessful. While the revised setup will work for scanning objects, there is simply insufficient memory to edit the resulting files. So, I digitally packed our three successful scans onto a USB drive for my students to edit when I got back to VCU. Intern Ariel Libbon edited the file and I created an animation of it my first day back on the VCU campus on August 14. 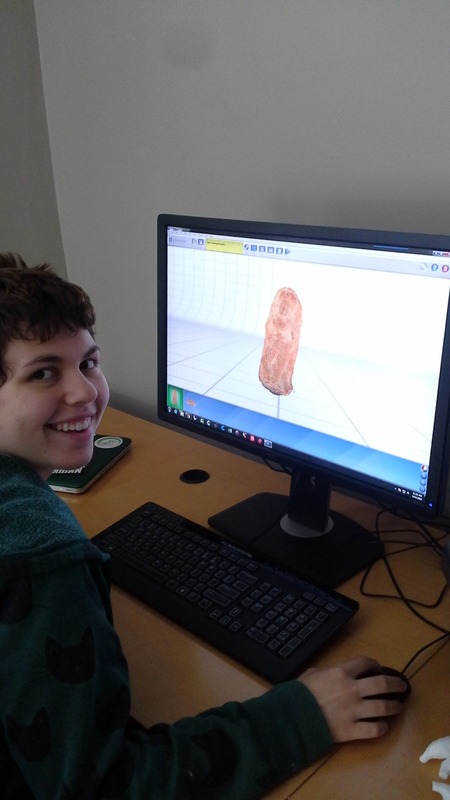 VCU undergraduate student Ariel Libbon edits the terracotta figurine in the Virtual Curation Laboratory. 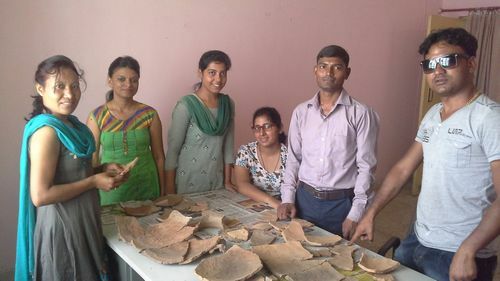 Until they can get a sufficiently powerful computer, my Indian colleagues will provide their digital artifact models to the Virtual Curation Laboratory, and I will return edited digital files, animations, and printed replicas to North India. Vinod and Mohan plan to visit VCU in November, and they will bring more digital files with them. 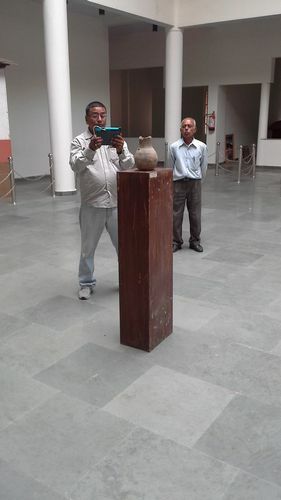 Sudhir scans a vessel while the museum security guard watches. During times where we were not scanning with the NextEngine 3D scanner, and I was not lecturing graduate students, Sudhir and I employed a Structure Scanner that I had brought with me. 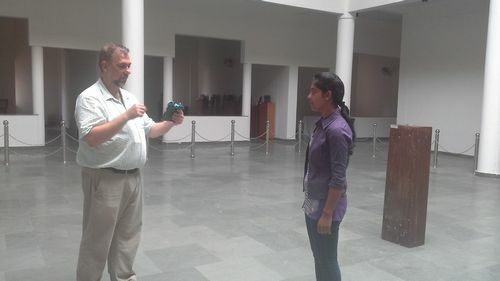 Although not as powerful as the NextEngine, it is much more portable, and the Structure Scanner (when fully charged) only needed to be mounted to an iPAD Mini (also fully charged) for unencumbered scanning of sculptures in the Museum of Himalayan Archaeology and Ethnography—as well as Mohan and Sudhir. Sudhir and I also used the Structure Scanner on some Neolithic pottery. Although of lower resolution than the NextEngine, the Structure Scanner is faster and also more readily useable on larger items such as sculptures. Oh, no! The Structure Scanner loses power mi-scan. You do have to remember to ensure that the Structure Scanner is fully charged. This is something I quickly learned when I attempted to 3D scan one of the graduate students. While I was there, Vinod applied for funding to obtained a Structure Scanner for his archaeology program, so this type of scanning can continue in the future. This scanner can also be taken easily into the field. 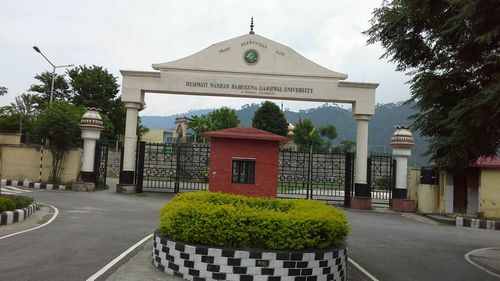 In the coming weeks and months, the Virtual Curation Laboratory at VCU and HNB Garhwal University will work to strengthen our collaborative efforts, and I look forward to a longer return visit in the future. 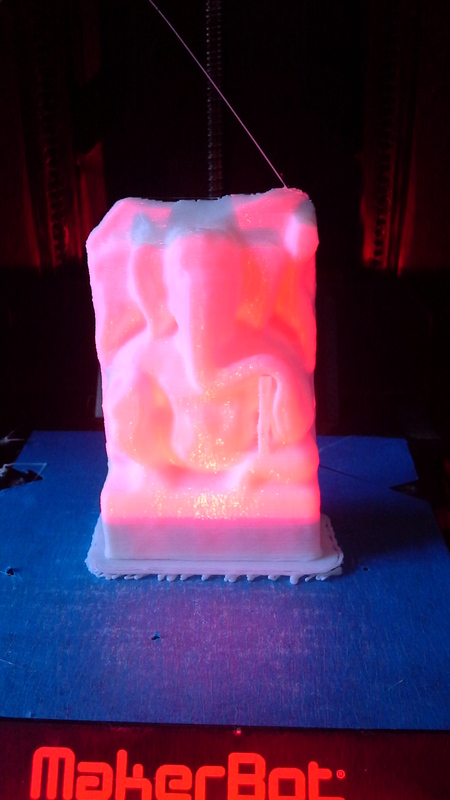 The digital models I obtained on my all-too-brief visit will be edited, 3D printed, and painted by interns in the Virtual Curation Laboratory, and some replicas will go on display in various campus locales, while the originals rest safely in Srinagar (Garhwal). hurray, ……..I was a Fulbright to India and thinking still of doing Ph D at VCU—–if those I receive responses …..communication is not VCU’s strong modality!!!!!! yeah, I agree with the latter….. PhD in what program?